It's not every Sunday that I get to hang in the comfort of my own home in Brooklyn and watch the Philadelphia Eagles football game. I'm originally from the Philly suburbs, and the Eagles are my team. But in NYC you'll need to go to an Eagles bar to catch a Sunday game — unless it doesn't coincide with a Giants or Jets game and the television network decides to show it. What happened yesterday? The last thing. So I invited a few fellow Eagles fans/friends over and got to work making "burgers" for gametime: All American Black Bean Burgers. These burgers were not planned for KLB. But they came out fantastic so I had to share the recipe with you. The sundae and pasta dish I mentioned on Saturday will still be coming up this week; the burgers are just an added bonus. Prepare the black bean mixture: Mash the beans with your hands in a mixing bowl, so that no whole beans are left. Add the wheat gluten, bread crumbs, cayenne, cumin, water, and ketchup, but don't mix yet. Use a microplane grater to grate the garlic in (if you don't have a microplane grater, mincing the garlic very finely will work, too). Grate in the onion. Mix everything together with a fork, and then proceed to knead with you hands until the mixture is firm and uniformly mixed. Season with salt and pepper to taste. Preheat a large pan over medium heat. 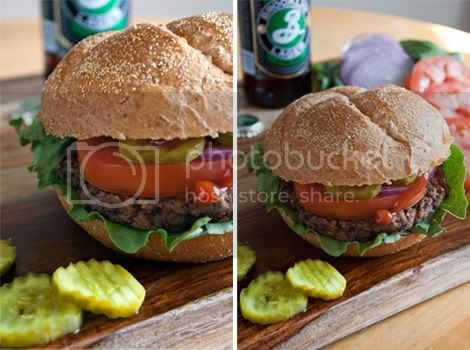 Divide the burger mixture into 5 equal pieces. Roll each piece into a ball and use the palm of your hand to press each ball down to form a patty (about 1 to 1 1/2 inch thick). Press so that each patty is flat on both sides. Coat the preheated pan with olive oil. Cook the patties (about 2 or 3 at a time) for 5 minutes on each side, gently but firmly pressing down on them with a spatula. Spray each patty with olive oil before flipping over to the other side for uniform browning. Meanwhile, prepare the buns: Slice each bun in half so that you have a top and a bottom half, and lay open on plates. Spread Vegenaise on the inside of all top and bottom halves. Lay a bed of lettuce on the bottom halves. Once cooked, place the burgers on top of the lettuce. 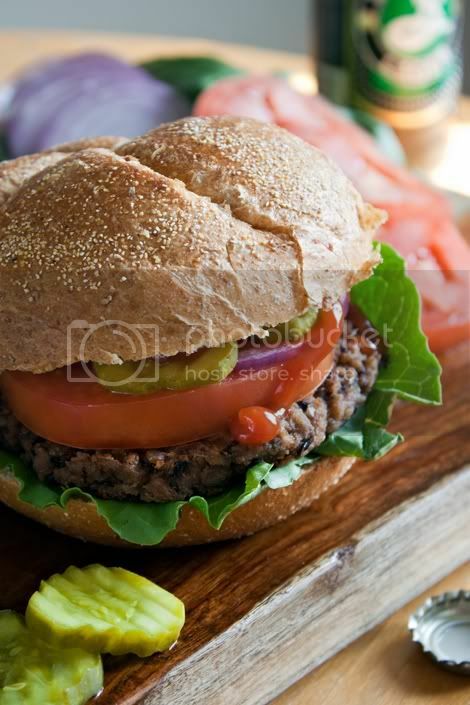 Add a tomato slice and red onion slices on top of each of the burgers. Top with pickles and a dash of ketchup, and the top halves of the buns. These sound yummy AND less diffcult than a lot of "burger" recipies I've read. Thanks! And thanks especially for the comment about the photos. I've really been having so much fun doing the photography. Plus, I've come such a long way from when I first started the blog (I was just taking snapshots of the food with my iPhone before I ate it)!